The romantic ruins of 13th century Usk Castle stand on the site of an earthwork defence dating to the early 12th century. A 12th century square stone keep, round tower and parts of a curtain wall survive. The 14th century gatehouse is part of a 17th century private home. 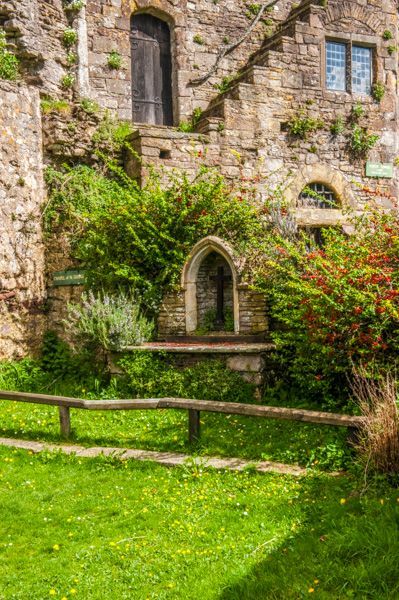 The castle ruins are surrounded by attractive topiary and an herb garden. The first castle was built in 1138 but most of the 12th-century structure is now in a ruinous state. The best surviving feature of this first castle is a Norman gatehouse, probably built by the de Clares. The first historical record of Usk Castle dates from 1262 when it was owned by Richard de Clare. It seems probable that it was in the possession of the de Clares from the time of the first Norman incursion into south Wales. The defences at Usk were strengthened by William Marshall, Earl of Pembroke. The Garrison Tower, with a wall walk that bypasses the tower itself, is similar to Marshall's building at Pembroke Castle, and may be his work. The castle passed through numerous hands during the 14th century, including the notorious De Spensers, favourites of Edward II, and was for a time owned by Edmund Mortimer, Earl of the Marches. When Edward II died the castle reverted to Elizabeth de Burgh, who put a lot of money into rebuilding and remodelling the castle. When nearby Grosmont Castle was sacked in 1405 by Owain Glyndwr, the English garrison took shelter in Usk Castle. Usk was itself besieged, but the defenders, led by Lord Grey of Codnor, routed the attackers and captured over 300 of the Welsh. In a brutal act of reprisal, the prisoners were massacred just outside the castle walls. In 1431 the castle passed to William ap Thomas, and then to his son, William Herbert, later named the 18th Earl of Pembroke. 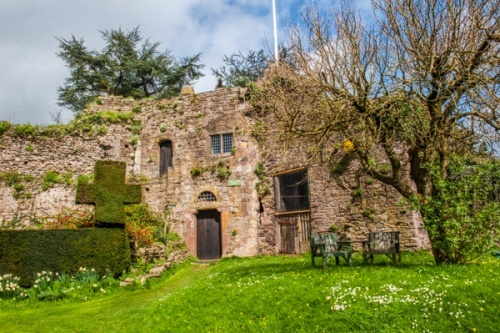 Herbert refurbished Usk Castle to create a much more comfortable residence, but he did not live long to enjoy it, for he was killed at the Battle of Edgecote in 1469. The castle fell into disuse after Herbert's death, and local people started taking stone from the castle for their own building projects. The castle passed to Edward IV, and remained a crown possession until Henry VII died in 1507, at which time it passed to the Earls of Pembroke. 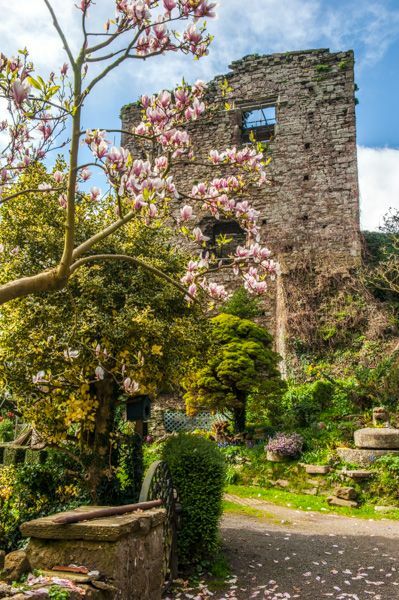 The gatehouse was transformed into a townhouse, but in 1933 the castle underwent a gradual program of excavation and 'beautification', with new gardens planted among the ruins to create a tranquil spot much at odds with the long and turbulent history of the medieval fortress. The castle stands on a spur of land overlooking the River Usk. It consists of a roughly rectangular area bounded by curtain walls interspersed with mural towers. There is an imposing gatehouse on the east side. An outer bailey lies to the south-east, with a south corner tower and a gatehouse. 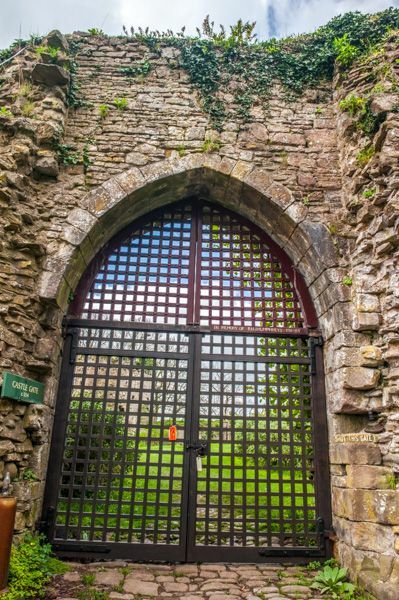 The gatehouse is one of the best-preserved features of Usk Castle; it is a three storey building accessed by a stone stair. The presence of an internal fireplace indicates at least a cursory attempt at creature comforts for the inhabitants. There is a 14th-century great hall with some early 16th-century remodelling, set against the curtain wall. A large circular tower known as the Garrison Tower stands halfway along the south-west curtain wall, and still stands to parapet height. This tower has a garderobe on the north side and a spiral stair opposite. On the north side is St George's Chapel, an open-air chapel created out of a section of the garden. 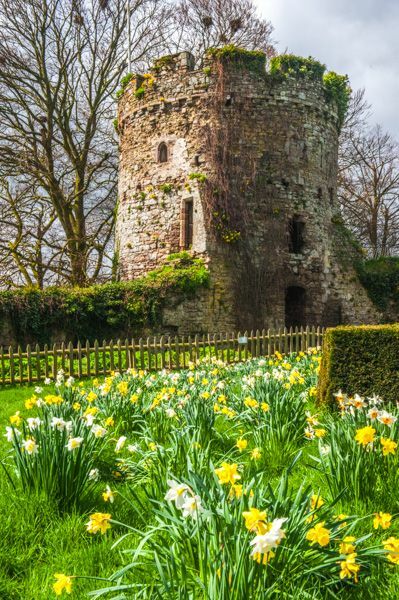 At the south end of the outer bailey is the so-called Dovecot Tower, which has niches set into one wall to serve as a nesting area for doves. There is a small parking area just outside the castle. It isn't easy to find the lane leading to the castle unless you know exactly what you are looking for; it is opposite the fire station on Castle Parade. Even though I knew what to look for I still drove right by the turning. Rather than try to navigate back to it I parked in the free town car park and walked back, a pleasant 10-minute stroll. The castle is open on an honesty box system; I put a donation in the jar and bought a very useful guide to the site. I was accompanied on my way around by 2 very friendly dogs, that soon wandered off when I proved less interesting than they'd originally thought. What is most striking about the castle is the modern garden. 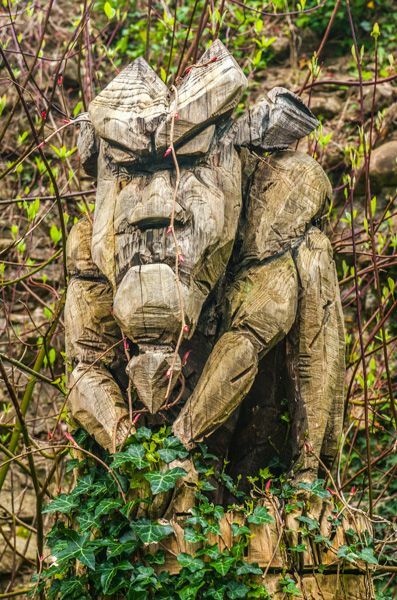 This is actually very attractive and does not in any way detract from the ambience; it almost seems to have grown there organically, though it was rather odd to see topiary sculptures of a large bird sitting inside the ruined castle walls. There are useful information signs and plaques identifying when each part of the castle was built. I loved the little chapel; it seems such a beautifully peaceful place to sit still and let the world slide by. 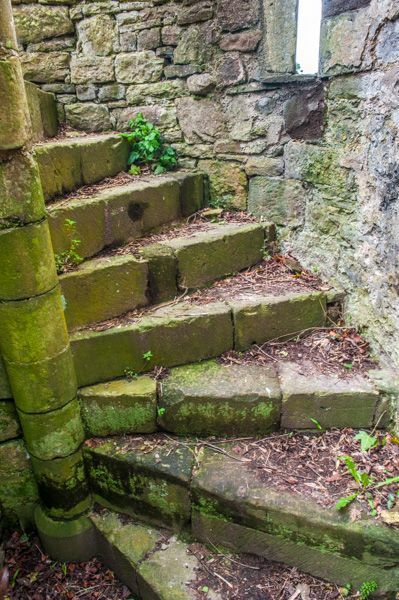 Be aware that several parts of the castle buildings are in poor repair; there are warning signs to remind you of the perils of crumbling masonry. You are perfectly safe to wander around the interior of the castle, though, and there's a very handy viewpoint with an excellent panoramic view across Usk and beyond. This is a beautiful, peaceful place, despite its bloody history, and I highly recommend a visit.